Restore One Carpet Cleaning, Repair & Stretching. Local Seattle carpet cleaning and repair company in business for 20 years. Carpet stretching for loose, wavy carpets. Carpet repairs for pet damage, cigarette burns, , broken seams, etc. Color Repairs: (rust, wine, coffee, paint, pet stains, Kool aid, bleach stains (with cleaning jobs only). We serve the Greater Seattle area from Everett to Federal Way and Seattle to Issaquah. We are a small locally owned quality minded carpet cleaning, stretching and repair company with two carpet cleaning truck mounted systems. We dress in uniforms and our trucks displayed company signs. We take pride in the quality of our work and love helping other people. We are still serving many of our original customers from 1995.
company. We guarantee our work 100%!! 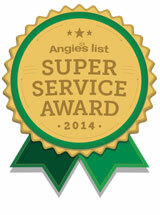 Super Service Award Recipients for 2010, 2011 2012, 2013, 2014. "The service was excellent. Mario was punctual, friendly and efficient. Quality of work was quite satisfactory and the price reasonable. I would use this company again." "I felt Mario was very professional and did a fabulous job. We were in a verge of changing it to hardwood floor, . After mario shampood the carpet it has become as new." "My husband and I needed someone to repair our carpet, because we were getting ready to put our home on the market. 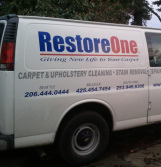 I contacted Mario at "Restore One", and he came over the very next day and repaired our carpet. Mario did such an excellent job, that it's almost impossible to see the area he repaired. We liked Mario's work so much, that we asked him to return to clean our carpets. I would highly suggest that ANYONE that needs their carpets cleaned or repaired to contact Mario. Mario takes pride in his work and it really shows."